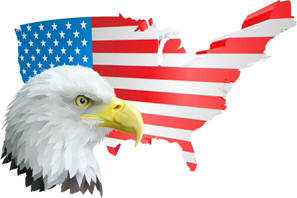 The Symbols of America are recognised throughout the world as emblems of the united states and its people. The Symbols of America represent its culture, values and pride. The official National symbols of America are the National flag, the Seal of the United States, the National motto ("E Pluribus Unum"), the National anthem (The Star Spangled Banner), the National bird (the American Bald Eagle), the National flower (the Rose), National Tree (Oak), the National March (The Stars and Stripes Forever) and the National Creed - the American's Creed. The National mottos: "E Pluribus Unum" "In God We Trust"
The Flag of the United States is one of the National Symbols of America. The Flag of the United States is also referred to as the Stars and Stripes, Old Glory, Red, White and Blue and the Star Spangled Banner. The American flag is the most important of all the national symbols of America that we have a whole section dedicated to the USA flag containing pictures, images, information, history and facts about the Stars and Stripes, together with details of Flag Day, etiquette, display and much more. Recommended reading: Star Spangled Stars History. The Nation's capital is Washington DC. This world famous city was conceived during the Revolutionary War when America gained independence from the British. The capital is named after George Washington (1732 – 1799) the first President of the United States. Washington DC is located on the East coast of America within the states of Maryland and Virginia. It is not a state, it is a small federal district and the home of many famous landmarks and monuments. The Great Seal of the United States is one of the National Symbols of America. The Great Seal of the United States is a symbol of authenticity that verifies that government documents and papers of state are legal and official. The images contained in the Great Seal of the United States capture the history, values and ideals of the people of America. Symbols of America - The National Motto "E Pluribus Unum"
The Mottos "E Pluribus Unum" and "In God We Trust" are National Symbols of America. 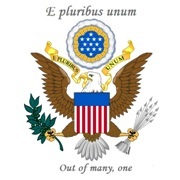 The National motto of the United States of America is the Latin phrase 'E pluribus unum', which translated into English means "Out of many, one". This famous National US Motto was recommended by Pierre Eugene du Simitiere (1736-1784) and submitted to the Continental Congress on August 20, 1776. The motto 'E pluribus unum' meaning "Out of many, one" is displayed on great National symbols such as the Great Seal of the United States. The motto 'E pluribus unum' can be found on most forms of US currency, on important state documents and also on the passports of Americans. The American's Creed is one of the less well known National Symbols of America and an expression of loyalty and patriotism. Its words are full of deep significance and meaning with references to important historical events and documents such as the Declaration of Independence, the Preamble to the Constitution, the Gettysburg Address, the Pledge of Allegiance and Daniel Webster's famous speech. Symbols of America - The National march, "The Stars and Stripes Forever"
The National march, "The Stars and Stripes Forever" is one of the National Symbols of America. The National march: "The Stars and Stripes Forever"
Symbols of America - The National anthem, "The Star Spangled Banner"
The National anthem, "The Star Spangled Banner" is one of the National Symbols of America. The National anthem: "The Star Spangled Banner"
The Official National Symbols of America are all detailed in the United States Code. The United States Code is the official compilation of the general Federal laws compiled by the Office of the Law Revision Counsel of the United States House of Representatives. The official United States National symbols detailed in Title 36, Chapter 10 and Chapter 3 of the United States Code. Title 36 consists of Patriotic and National Observances, Ceremonies, and Organization and Chapter 3 details the National Anthem, Motto, Floral Emblem, and March.